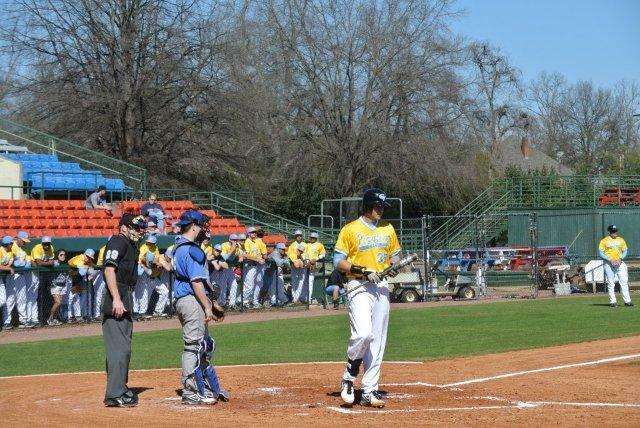 After a big 3 game conference home away from home sweep of Marion Military Institute this weekend, the Pirates hit the road to face the Tigers in their park for single game and then came back to Golden Park for a double header against Faulkner University on Wednesday in non-conference action. Chatt Valley continued their winning ways, dismantling MMI by a score of 16-4 and then squeaking by the Eagles with 4-3 and 6-3 wins. On Tuesday, Coach Thomas sent Hunter Mitchell to the bump for CVCC, making his first conference start in 3 weeks. The offense gave him plenty of run support, plating 14 runs in the first 4 innings of the game. After squandering a run scoring opportunity in the first, the Pirates loaded the bases on 2 hit by pitches and a single by Cody Walker. Gaige Garrett drove in the first run with a sacrifice fly and David Levy followed him with an RBI sacrifice bunt to give the Pirates a 2-0 lead. The offense absolutely erupted in the 3rd by sending 14 hitters to the plate and scoring 8 runs to, for all practical purposes, put the game away. Walker’s RBI hit and run single was the catalyst of the inning that was surrounded by 4 walks and a hit by pitch. The flood gates then opened with a Levy 2 run double and Big Time’s RBI single. After about 40 minutes of hitting and when the smoke cleared, the Pirates handed Mitchell a 10-0 lead. Mitchell did his part and put zeroes on the board for 4 consecutive innings, scattering 10 hits and pitching out of a bases loaded jam in the 4th. In the Pirates half of the 4th, Massengale’s second RBI single and Nick Jones’ RBI double pushed the Pirate lead to 14-0. The Tigers finally got to Mitchell in the 5th. After getting 2 quick outs, 2 homers and 2 doubles later, MMI closed the gap to 14-4. Reliever Colt Ramsey came in a swiftly extinguished any hope of a Tiger rally, surrendering only a single hit and striking out 3 over the final 2 1/3 innings of the mercy rule shortened game. CVCC added 2 more runs in the 6th on Sam Knight’s 2 run single to push the final margin to 16-4. Wednesday saw a completely different Faulkner JV squad come to town than the one the Pirates dismantled last week by a combined score of 36-2. Game 1 starter Cody Sheffield was solid in his first start of the year, tossing 3 innings and surrendering 3 runs (1 earned) on 3 hits with 3 walks while striking out 5. Down 3-0 in the third, Chatt Valley rallied for 2 runs on RBI singles by Dominique Smedley and Jared Martin to cut the deficit to 3-2. Nate Morris was spectacular in relief, throwing 4 shutout innings, allowing only a single hit, while striking out 5 to hold the Eagles at bay to give the offense a chance to win. In the bottom of the sixth, Big Time Timothy James Massengale tripled to lead off the inning, while Jared Martin reached on a fielders choice to put runners at the corner with none out. Nick Jones singled to tie the game at 3 and Martin then later scored the decisive run on a passed ball to give the Pirates a come from behind, nail biting, 4-3 win. Payne Kosobucki got the start in game 2, throwing 5 impressive innings, scattering 5 hits, and striking out 4, while surrendering 2 runs in earning his first collegiate victory. CVCC go to work early, pushing 3 runs across in the first inning on a Nick Jones double and Cody Walker single. Right back to work in the third, Jerric Johnson drove in a run on an RBI groundout, while shortstop, David Levy, continued his hot hitting, driving in a run with a 2 out single. With a 6-2 lead, the bullpen finished things off, as Casey Hanna tossed the 6th, allowing a single run and Chris Brown picked up his second save of the year, throwing a clean 7th inning. The Pirates push their record to 33-4 on the season and will take the next few days off with their conference bye coming this weekend. CVCC is back in action on Monday, April 8th against Point University at Golden Park.